Andy asked if he could make a bluetooth phone-controlled Robot, so we thought we'd give it a go. We even managed to make it voice-controlled, without having to write any software for the phone! 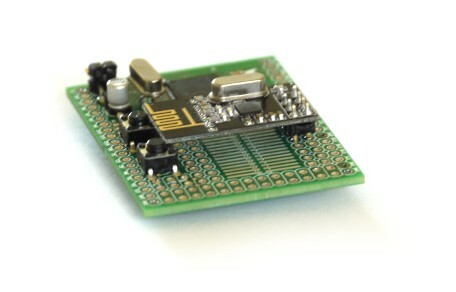 We've also just added a new reward - the Low Power Wireless Kit. It's got two Espruinos, and two of the amazing NRF24L01+ wireless transceivers. These use virtually no power when in standby and work from up to around 60m away, so you can leave one Espruino inside and have one battery-powered Espruino outside transmitting data back to you every minute! You could even buy another wireless module, connect that to a Raspberry Pi, and then control your two Espruino boards wirelessly from the internet! @Gordon - thanks for considering my suggestion and making it a reality. Having choices of both BT and NRF in the kit will be a definite plus. Appreciate it! Yes, I've been thinking of that - unless we design and make our own (which would be ideal) I'm not sure we'll be able to supply it in the kit at a sensible price though. I got an Adafruit CC3000 module today, but in the UK it costs about as much the whole Low Power Wireless Kit! For the £99 wireless experimenter kit tier, would it be possible to swap out a couple of the Bluetooth modules for NRF24L01+ transceivers? Looking to be able to tinker with both wireless technologies. At the moment that functionality is only on the Raspberry Pi version, but we're planning on adding a driver for the CC3000 WiFi chip (used in the Spark Core/Tessel/etc) so the Espruino board you get should have that functionality by the time you get it! Andy: It should be pretty easy (but you'll have to butcher a few of the lego cables so that you can connect it up nicely). The motor driver chip would drive 2 motors (or 4 if you only want them to go one way) easily, but you could solder on two ULN2003 chips instead and get enough powered outputs for 14 lights/motors! Great thanks :D I think I may have to get a few of these. A good example would be how easy is it to work with lego technics? What would it take to connect an espruino board to the internet? Keep in mind I'm a complete noob when it comes to electronics, but I do have a good understanding of http.